What are the tutorials for? What audiences are the tutorials for? How is the content licensed? How can I cite this effort? How can I advertise the training materials on my posters? Where can I run the hands-on tutorials? What Galaxy instance should I use for my training? What are the best practices for teaching with Galaxy? How can I get started with contributing? How can I report mistakes or errors? How can I test an Interactive Tour? How can I fix mistakes or expand an existing tutorial using the GitHub interface? How can I create new content without dealing with git? How can I contribute in “advanced” mode? Are there any upcoming events focused on Galaxy Training? This material is developed and maintained by the worldwide Galaxy community. You can learn more about this effort by reading our article. Galaxy is an open data integration and analysis platform for the life sciences, and it is particularly well-suited for data analysis training in life science research. These tutorials can be used for learning and teaching how to use Galaxy for general data analysis, and for learning/teaching specific domains such as assembly and differential gene expression analysis with RNA-Seq data. There are two distinct audiences for these materials. Self-paced individual learners. These tutorials provide everything you need to learn a topic, from explanations of concepts to detailed hands-on exercises. Instructors. They are also designed to be used by instructors in teaching/training settings. Slides, and detailed tutorials are provided. Most tutorials also include computational support with the needed tools, data as well as Docker images that can be used to scale the lessons up to many participants. The content of this website is licensed under the Creative Commons Attribution 4.0 License. We wrote an article about our efforts. We provide some QR codes and logos in the images folder. Learning Galaxy and data analysis on your own and at your own pace? This material is for you. If you are new to Galaxy then start with one of the introductory topics. These introduce you to concepts that are useful in Galaxy, no matter what domain you are doing analysis in. If you are already familiar with Galaxy basics and want to learn how to use it in a particular domain (for example, ChIP-Seq), then start with one of those topics. If you are already well informed about bioinformatics data analysis and you just want to get a feel for how it works in Galaxy, then many tutorials include Instructions for the impatient sections. Many topics include slide decks and if the topic you are interested in has slides then start there. These will introduce the topic and important concepts. Most of your learning will happen in the next step - the hands-on tutorials. This is where you’ll become familiar with using the Galaxy interface and experiment with different ways to use Galaxy and the tools in Galaxy. To run the hands-on tutorials you need a Galaxy server to run them on. Each tutorial is annotated with information about which public Galaxy servers it can be run on. These servers are available to anyone on the world wide web and some may have all the tools that are needed by a specific tutorial. If your organization/consortia/community has its own Galaxy server, then you may want to run tutorials on that. You will need to confirm that all necessary tools and reference genomes are available on your server and possible install missing tools and data. To learn how to do that, you can follow our dedicated tutorial. Some topics have a Docker image that can be installed and run on participants’ laptops. These Docker images contain Galaxy instances that include all tools and datasets used in a tutorial, as well as saved analyses and repeatable workflows that are relevant. You will need to install Docker. Finally, you can also run your tutorials on cloud-based infrastructures. Galaxy is available on many national research infrastructures such as Jetstream (United States), GenAP (Canada), GVL (Australia), CLIMB (United Kingdom), and more. These instances are typically easy to launch, and easy to shut down when you are done. If you are already familiar with, and have an account on Amazon Web Services then you can also launch a Galaxy server there using CloudLaunch. If you have questions about this training material, you can reach us using the Gitter chat. You’ll need a GitHub or Twitter account to post questions. If you have questions about Galaxy outside the context of training, see the Galaxy Support page. This material can also be used to teach Galaxy and data analysis in a group setting to students and researchers. Spend some time exploring the different tutorials and the different resources that are available. Become familiar with the structure of the tutorials and think about how you might use them in your teaching. To teach the hands-on tutorials you need a Galaxy server to run the examples on. the server can support a room full of people all doing the same analysis at the same time. all tools and reference datasets needed in the tutorial are locally installed. To learn how to setup a Galaxy instance for a tutorial, you can follow our dedicated tutorial. all participants will be able to create/use accounts on the system. Some training topics have a Docker image that can be installed and run on all participants’ laptops. These images contain Galaxy instances that include all tools and datasets used in a tutorial, as well as saved analyses and repeatable workflows that are relevant. Finally, you can also run your tutorials on cloud-based infrastructures. Galaxy is available on many national research infrastructures such as Jetstream (United States), GenAP (Canada), GVL (Australia), CLIMB (United Kingdom), and more. The support channel for instructors is the same as for individual learners. We suggest you start by posting a question to the Galaxy Training Network Gitter chat. Anyone can view the discussion, but you’ll need to login (using your GitHub or Twitter account) to add to the discussion. If you have questions about Galaxy in general (that are not training-centric) then there are several support options. First off, thanks for your interest in contributing to the Galaxy training materials! Individual learners and instructors can make these training more effective by contributing back to them. You can report mistakes and errors, create more content, etc. Whatever is your background, there is a way to contribute: via the GitHub website, via command-line or even without dealing with GitHub. We will address your issues and/or assess your change proposal as promptly as we can, and help you become a member of our community. You can also check our tutorials for more details. If you would like to get involved in the project but are unsure where to start, there are some easy ways to contribute which will also help you familiarize yourself with the project. A great way to help out the project is to test/edit existing tutorials. Pick a tutorial and check the contents. Does everything work as expected? Are there things that could be improved? Below is a checklist of things to look out for to help you get started. If you feel confident in making changes yourself, please open a pull request, otherwise please file an issue with any problems you run into or suggestions for improvements. Are the objectives, keypoints and time estimate filled in? Do they fit with the contents of the tutorial? Is there enough background information provided in the introduction section and throughout the tutorial? Does the screenshot add value to the tutorial or can it be removed? At the end of each tutorial, there is a link to a feedback form. We use this information to improve our tutorials. For global feedbacks, you can open an issue on GitHub, write us on Gitter or send us an email. The easiest way to start contributing is to file an issue to tell us about a problem such as a typo, spelling mistake, or a factual error. You can then introduce yourself and meet some of our community members. Perhaps you’ve been asked to review an interactive tour, or maybe you just want to try one out. The easiest way to run an interactive tour is to use the Tour builder browser extension. Install the Tour Builder extension to your browser (Chrome Web Store, Firefox add-on, Opera add-on). Navigate to a Galaxy instance supporting the tutorial. To find which Galaxy instances support each tutorial, please see the dropdown menu next to the tutorial on the training website. Using one of the usegalaxy. * instances (Galaxy Main, Galaxy Europe, or Galaxy Australia ) is usually a good bet. If you feel uncomfortable with using the git and the GitHub flow, you can write a new tutorial with any text editor and then contact us (via Gitter or email). We will work together to integrate the new content. 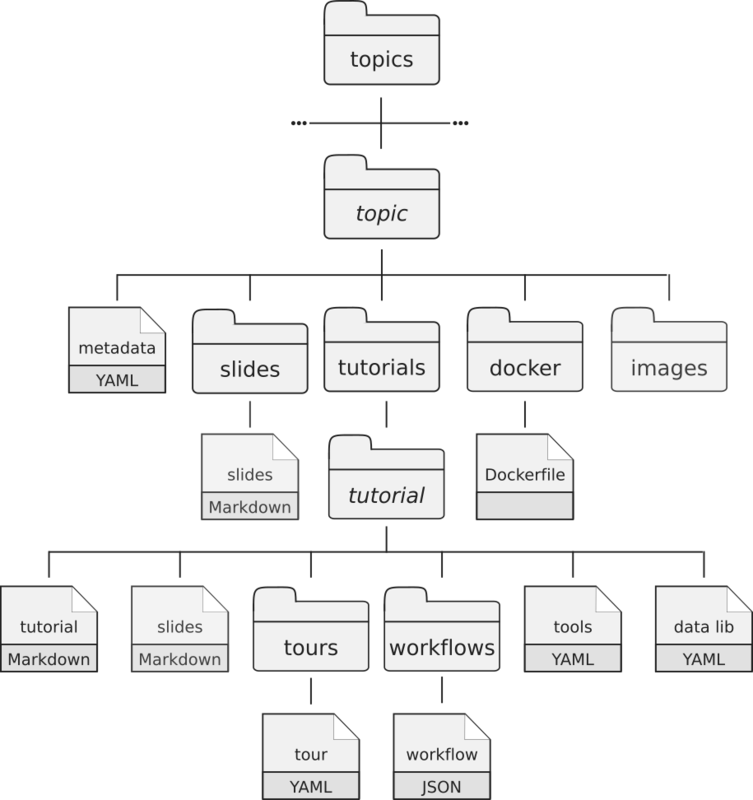 a directory with the Dockerfile describing the details to build a container for the topic (self-study environments). Upload of the datasets to Zenodo and addition of the links in the data library file. We also strongly recommend you read and follow The Carpentries recommendations on lesson design and lesson writing if you plan to add or change some training materials, and also to check the structure of the training material. In issues, you will find lists of issues to fix and features to implement (with the “newcomer-friendly” label for example). Feel free to work on them! Yes, always! Have a look at the Galaxy Community Events Calendar for what coming up right now. This repository is hosted on GitHub using git as a DVCS. Therefore the community is hosting backups of this repository in a decentralised way. 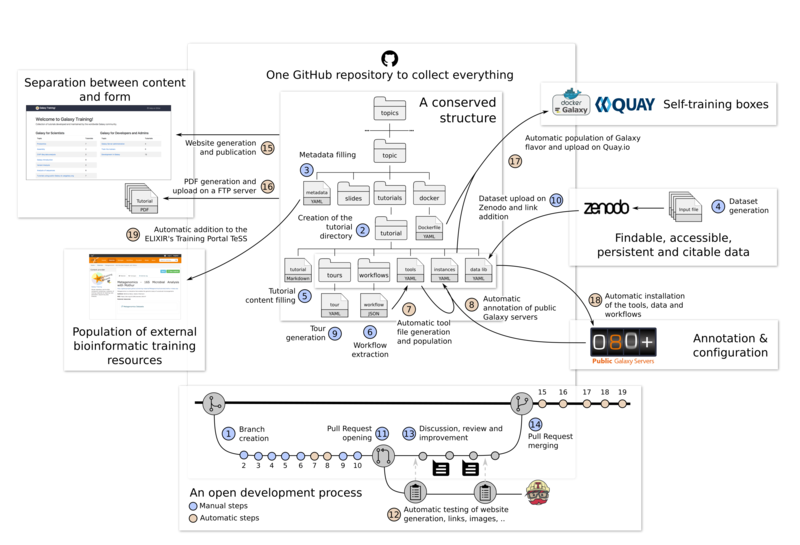 The repository is self-contained and contains all needed content and all metadata. In addition we mirror snapshops of this repo on Zenodo.